The amendment of the Act relating to Ministerial elections. The incident which I will now describe to you was one of the causes which led to the amendment of the Act relating to Ministerial elections. Nasim Bey, who was Deputy for Tokat, was elected Minister of the Interior on the 4 th September by the Assembly by 98 votes against 89. In great haste and without losing a minute, Nasim Bey went to the Ministry and began to carry out his duties. Then he came to pay me a visit in my capacity as President of the Executive Council. I declined to receive Nasim Bey. In refusing to receive a Minister who possessed the confidence of the High Assembly and had been elected by it, I was naturally fully conscious of the delicacy of my position; but the higher interests of the country imposed upon me the duty of acting in this manner. Of course, I felt certain that I could justify my attitude and convince the High Assembly to recognise the importance of the point I had to bring before them. There were some members of the Assembly who were inclined to hold strange and exaggerated ideas. Nasim Bey and his friends were among them, and he had specially attracted my attention. I had come to a perfectly correct opinion about the thoughts and character of Nasim Bey from several letters I had received from him during the Sivas Congress and which were full of specious fallacies. On his arrival at Angora as a deputy, Nasim Bey developed a new form of political activity every day. He did not miss an oppor tunity of coming into touch with each of the political parties as they made their appearance. Nasim Bey had also found the means of getting, directly or in directly, into touch with foreign circles and had succeeded in gaining their encouragement and support. You are surely aware that this person had undertaken, for the sole purpose of serving his own inter ests, to form a party which he called the “Communistic People s Party.” It lacked any serious character, and, as its leader, his in tention was to occupy himself with anti-national affairs. I had no doubt that this person was engaged in espionage on behalf of foreign countries. At a later date the Independence Court exposed more than one sad truth about him. Now, this same Nasim Bey, thanks to the continual propaganda he and his friends had issued, had eventually succeeded in getting into the Ministry of the Interior. This success was also due to the help of those who had forgotten the higher interests of the nation and had worked up an opposition against us. 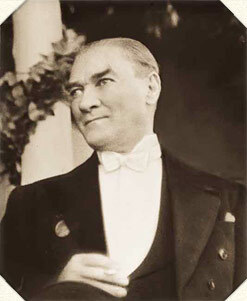 In this manner Nasim Bey had succeeded in putting himself at the head of the whole of the inner administrative machinery of the Government and in holding a position which enabled him to render the greatest services not to the nation and the country, but to those whose paid servant he was. It was natural that I could not acquiesce in this, and that is why I did not receive Nasim Bey, Minister of the Interior, but forced him to resign his office. When the opportunity came, I frankly exposed the information I had received and my own ideas concerning him to the Assembly at a secret sitting. You are well aware that the greatest danger to our country and nation in those territories which were or still are governed by Sultans and Caliphs consists of the fact that the latter are bought by the enemy. Generally speaking, this is an easy matter. On the other hand, for those territories governed by National Assemblies, the most dangerous thing is that certain deputies can be bought and enlisted for the ser vice and in the name of foreign countries. If we look at examples in history, we must indeed admit that it is not impossible to find men devoid of patriotism who have succeeded in getting into National Assemblies. For this reason a nation must be very careful whom they elect as their representatives. The safest way to protect the nation from error is to guide it during the elections by a political party which has gained the con fidence of the people through their ideas and actions. Even if we accept in theory that the majority of citizens is possessed of authentic in formation enabling them to express themselves about each of the can didates and to form a correct judgment of him experience bears this out this is apparently not an infallible truth.